These 20 crazy gift ideas will make you shout – I want one too! Gifts always spread happiness and if it a crazy one like these, it becomes a memorable one. Here are 20 crazy gift ideas which can be a very special for your beloved one. 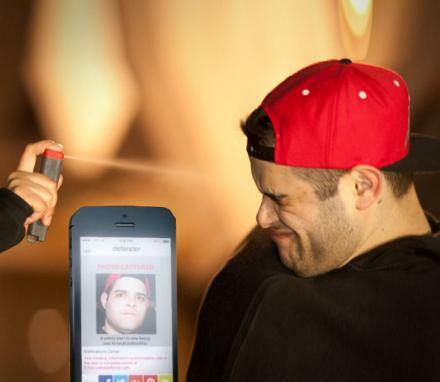 1. Pepper Spray: This pepper spray is a brilliant gift for women who likes to jog at night. It not only sprays the pepper, but also takes a picture with flash, detects GPS information and sends them to the police. It also plays a loud alarm while spraying. 2. SlideRider: Busy to take your kids to the playground? Gift them a SlideRider. 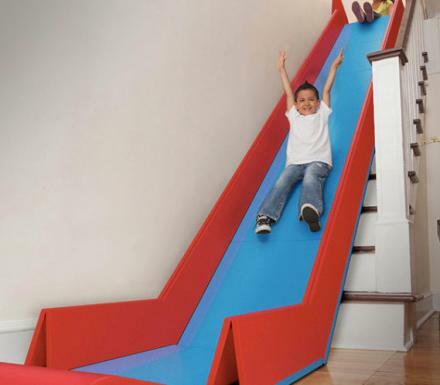 It is an indoor slide that can be folded and carry easily as a package. Most importantly, it can turn your stairs into a slider with a twinkle of an eye. 3. Have a Nice Day Mug: This just a simple coffee mug with “Have a Nice Day” printed on it. However, the back of the mug makes it crazy as it sports a middle finger. An awesome gift for a cool Boss or Grandmother. 4. 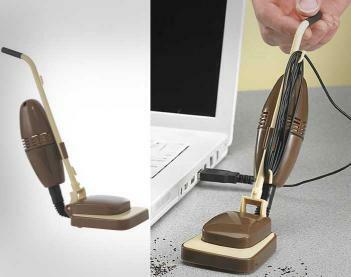 Mini Desk Vacuum: Your husband probably nagging about his hassle to clean up his office desk. Buy him this Vacuum cleaner. Of course, its main feature is to clean up the desk, but to do so, it takes power from a computer or laptop USB port. 5. 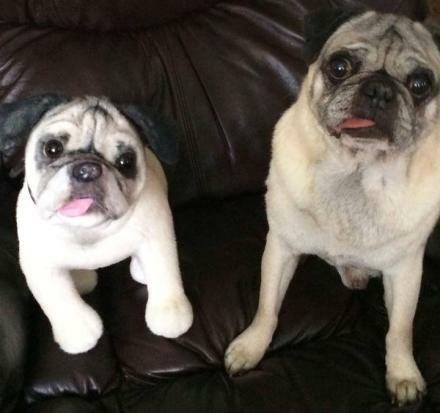 Cuddle Clones: It is a service that makes lookalike stuffed animal version of any favorite pet. Just send them a few pictures, choose tail and ear position along with the other characteristics, and wait for the real version of your pet. Stuffed version of fish, bird, lizard, ferret or any other small creature costs $129 while Dogs, Cats, Donkey, etc. costs $199. 6. Foaster: Ever heard of foaster? Yeah, you heard it right. It’s foaster not toaster. 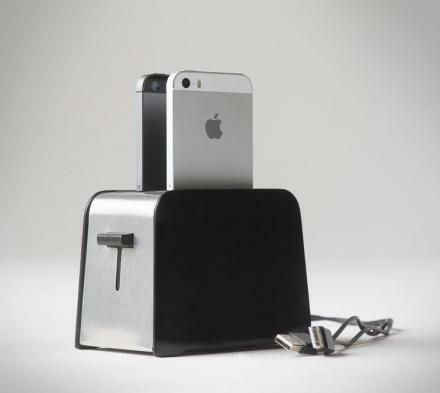 It is a toaster like gadget which can charge two devices (version 1) and four devices (version 2). 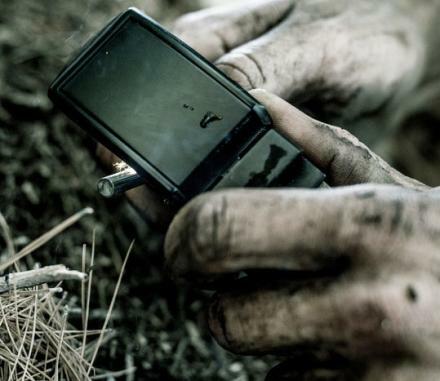 The version one is limited to iPhones, however the version two can charge android phones also along with tablets. 7. 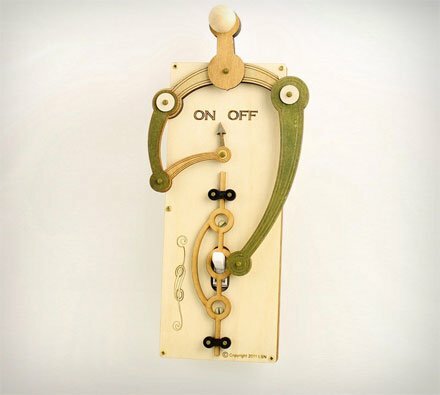 Light Switch: This classic light switch brings a ship like theme into your electric line. It comes in many shapes and design, but always features a compass to show whether your light is on or off. 8. Cat Hat: Like to pet animals? Then pet a lion! Just kidding! 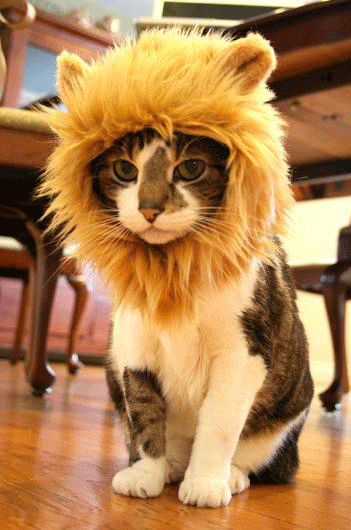 However, you can easily turn your cat or dog into a lion, with the help of this Lion Mane cat hat. The beautiful, yet shocking hat has 3 inches opening at the front and 3.5 inches at the back and comes in caramel color. 9. 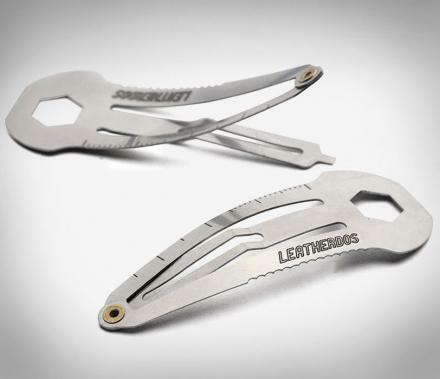 Leatherdos: What it is, it is a three different screwdriver, a knife, a wrench and also a ruler. The funny thing is, it is just a hair clip too. Clip it to the hair and you have a whole range of tools with you. 10. Slide Belt: This is a belt that will save you from the wilderness. It has a bottle opener, a ratchet belt, a GPS locator, a knife,a fire starter and many more survival equipment built into it. The Slide Belt can measure 50 inches x 1.25 inches. The belt is offered in 30 different sizes which is waterproof and UV protected. 11. 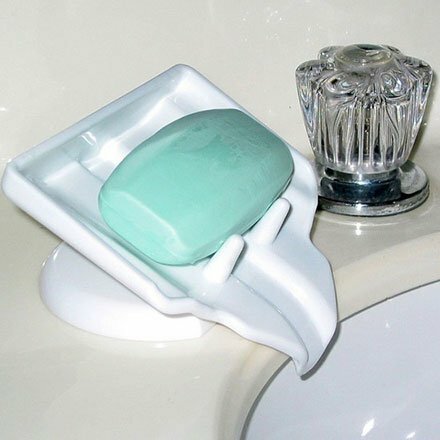 Soap Dish: With this special soap dish in your shower, your soap will never remain wet to give you a disturbing feeling. 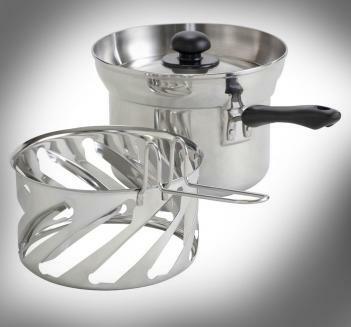 It features a unique sloped design that drags every bit of water out of the dish. 12. 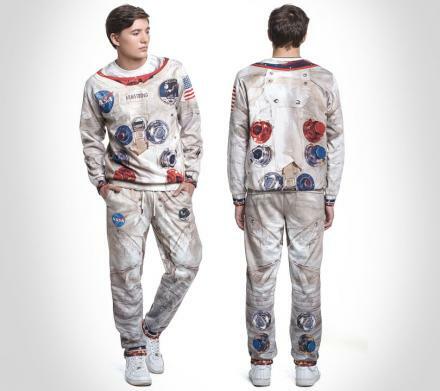 Astronaut Sweatshirt and Sweatpants: Have a younger brother, or boyfriend, or a son – whoever it is, if he has a fascination for astronauts, buy this amazing sweat suit for him. It is exactly what the Apollo 11 astronauts wore to their journey to the moon, except that it is just a sweat suit. 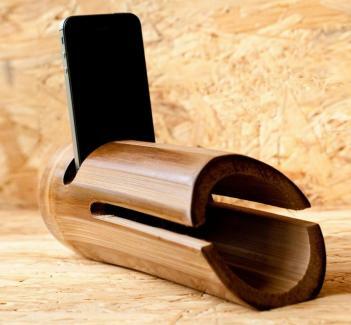 13. iBam Speaker: This is just a beautiful slice of bamboo that sounds like a speaker. Voted #1 green product of 2012, this nature made speaker can turn your smartphone sound into a mini concert. Moreover, 70% of the money you pay for this speaker will go into the fund to help vulnerable woman and poor craftsman. 14. 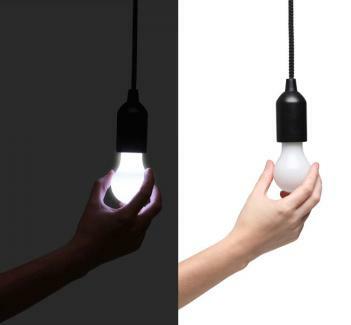 Tugg it pull bulb: This is a battery operated single light that has a magical control. Just tug it a little to switch it on, tug again to switch off. Most importantly, hang it to anything and it will remove the darkness. 15. 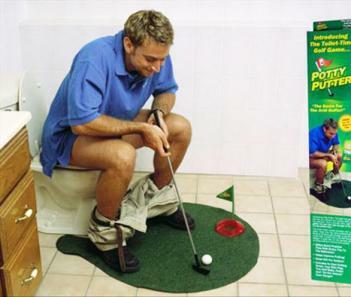 Toilet Putting Green: Got a person so crazy about golf that he even sleeps with it? He must be missing it in the toilet then? No problem, buy a toilet, putting green that will effectively turn his poo time a quality golf time. 16. Bicycle ring: Crazy about Bicycle? Carry them on your finger then. No, not the real one, but the ring version of it. 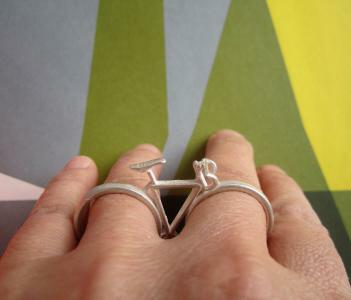 This two fingered bicycle ring can fit a miniature body bicycle in between your fingers. 17. Kurukurunable Pot: This kurukurunable pot effectively makes you a cook, by decreasing the unbearable cooking hassle. This pot can stir the food by itself using the boiling water. It also helps to prevent foods to boil over the edge. 18. 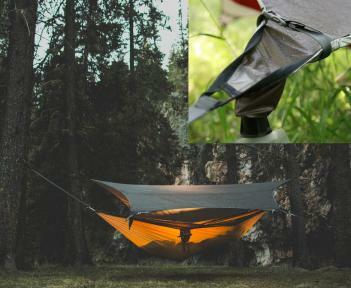 Hammock Tent: On normal eyes, it is just a hammock tent from Kammok for single person which also has a tarp draped over it. However, this magic is in its tarp which is equipped with patented technology that captures the rainwater into a water bottle. 19. Baby Stroller: By now, you know that we don’t put a normal thing on this list. We don’t intend to do that now. Look at this amazing baby stroller. Notice something? 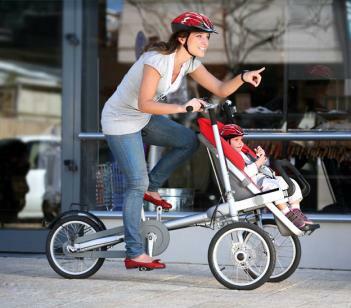 Effectively, it is a bicycle too, which helps to save you from all those hassle of strolling with you kid. 20. Remote control Airbus: Airbus A380, the largest passenger plane in the world can be controlled by you from now on, except that it just a model version. 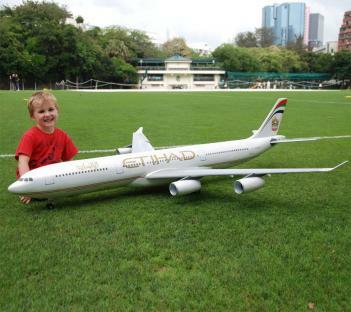 However, this true scaled plane is quite large to be called a toy as the model’s wings span of 78 inches. Be careful not to run it into a tall building. This post was inspired by odditymall Thanks! If you like the crazy gift ideas and if you like to be the crazier for now, briff.me can satisfy you with the exclusive and crazy 3D tattoos. Don’t miss 25 Crazy Tattoos in 3D Insane!